It’s funny how certain brands elicit certain expectations or even prejudices. For example, when you say Hallberg-Rassy, you think of durable stick-built boats battling formidable winds in higher latitudes with spray flying and green water over the bow. But with 96 percent of HRs exported out of their home country of Sweden, surely some have to end up in sunny climes where the breezes are light. How do they do there? Just fine, it turns out. Not only that, but they get compliments no matter where they go. The HR 412 is Hallberg-Rassy’s largest aft cockpit model, built on a newly designed hull. 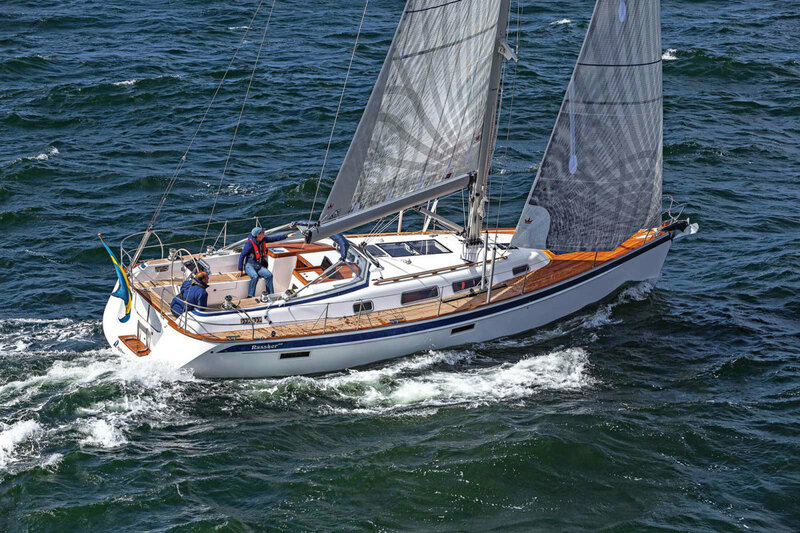 Since 1988, Hallberg-Rassy has used German Frers as its exclusive design firm and all the models (31-64ft) have a traditional appearance with no hard chines or plumb bows. Beyond that, one of the best ways to recognize an HR is by the signature rubbing strake and windshield that have continued on the newer models. Construction includes a Divinycell foam core sandwich to the waterline with solid glass below. An integral grid reinforces the hull, and the deck is added before the boat is finished out with furniture and equipment. Because it all comes in via the companionway, it can also can go out that same way when it’s time to repower or add a genset—a huge benefit. 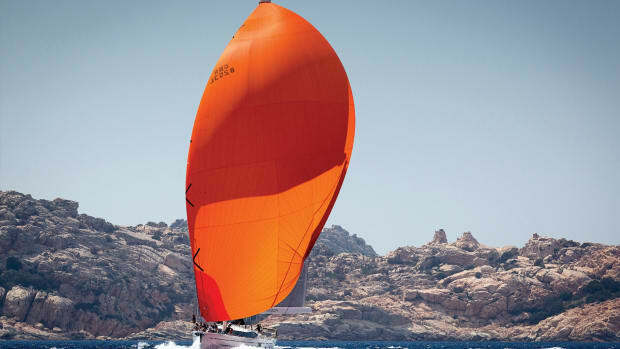 There is only one choice of keel: a bolt-on lead fin that draws 6ft 7in. 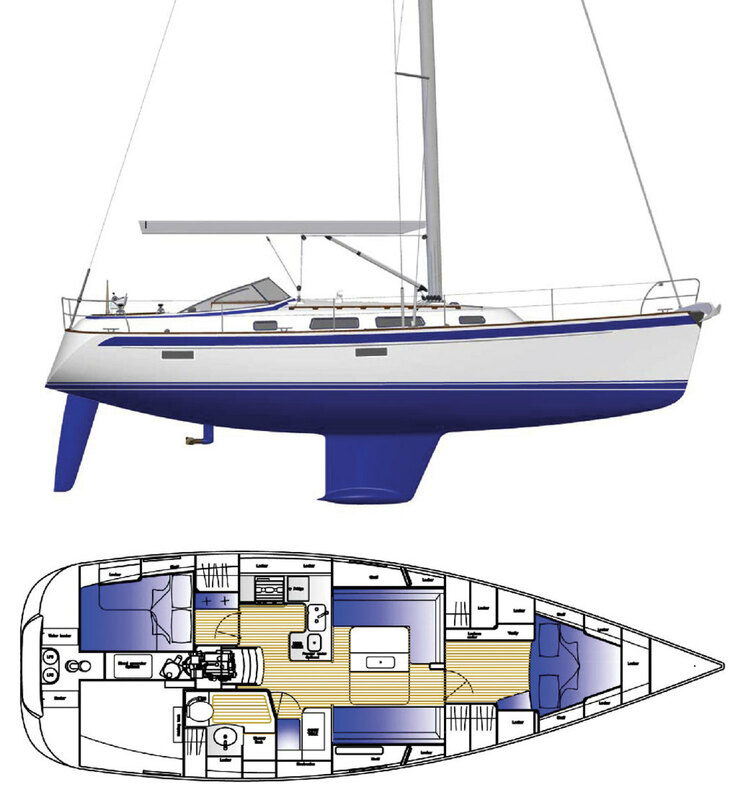 The deck-stepped, triple-spreader spar is by Seldén (as is the rigid Rodkicker vang) and with an air draft of 64ft 6in, the HR 412 will struggle with bridge clearances on the ICW. 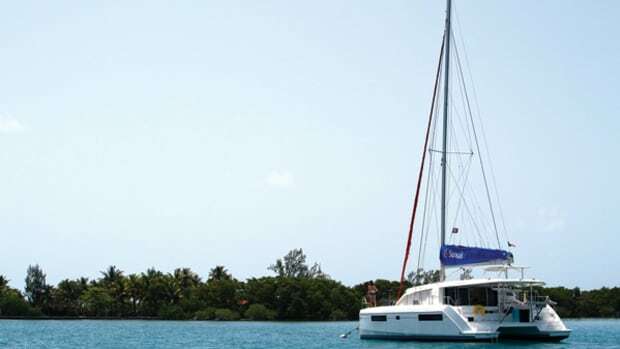 Standard sail area is 970ft², with the headsail on a belowdeck Furlex furler. The sheeting angles are tight, and the side decks are notably wide and really easy to navigate. The aft cockpit is quite large and deep, with an enormous centerline wheel that says the 412 aspires to great things on the racecourse. 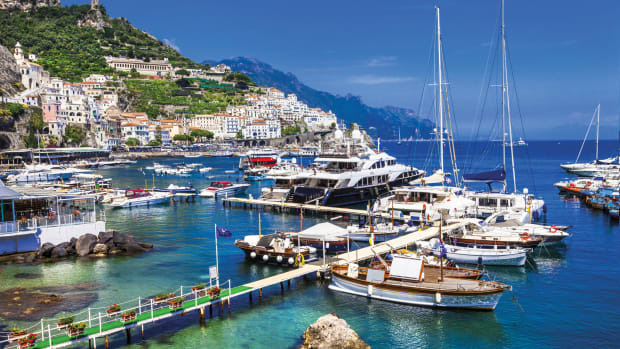 The console is comprehensive with a 12in Furuno (or Raymarine) multifunction display, Fusion stereo head, remote anchor windlass control and wind instruments and joysticks for the optional Side-Power bow and/or stern thrusters. The engine throttle is to the right of the MFD, nice and high, so there’s no need to bend down to shift, at the same time taking your eyes off the bow when docking. A stainless steel handrail is integrated into the forward end of the console. All lines are led aft under the deck to four Lewmar winches via sheet stoppers. The large spaces on either side of the companionway have no winches and instruments are built into a shelf just above the slider so everyone can see them from anywhere in the cockpit. The split backstay has a tackle tensioner for easy adjustment, and the transom helm seat hinges up to the side to reveal convenient access to the water. 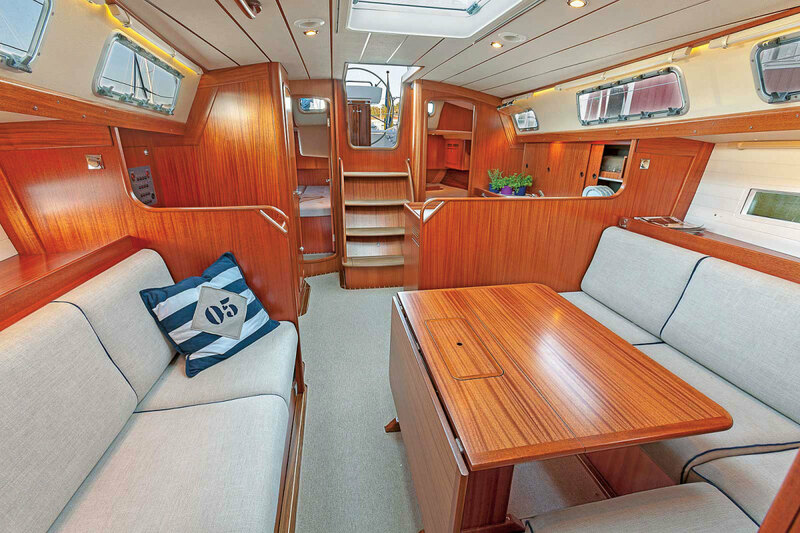 The mahogany finish belowdecks is the only one offered and is impeccable. Layout choices include two or three cabins with one or two heads. 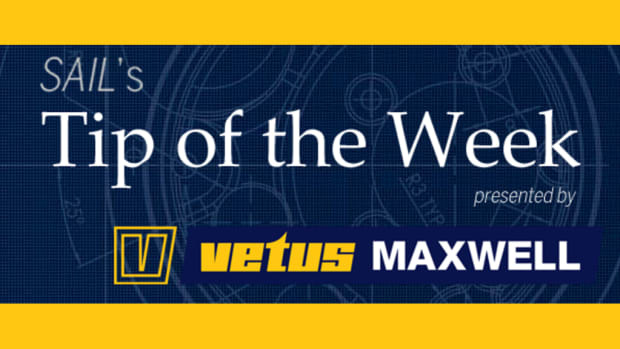 The master forward also offers a few nice options, including a head with or without a shower stall and a standard V-berth or center island bed. Couples needing only one head may enjoy the island berth and larger stateroom with more stowage space for long term cruising. The C-shaped galley is to port with twin sinks, a top-loading Isotherm refrigerator and small separate freezer. The two-burner Eno stove/oven combination sits next to the fridge. The saloon is brightened by dual opening hatches overhead and opening ports in the cabintop, which are the same size as those on the HR 54. An L-shaped settee is tucked behind a drop-leaf table that connects with the other side at mealtimes. There is a choice of either two built-in chairs or a straight settee to starboard. The latter will make a nice sea berth underway. House batteries are below the settees, and are wet cells for a deeper discharge and longer life. A separate thruster battery is forward below the master berth and is AGM. A proper, forward-facing navigation desk is to starboard just ahead of the aft head. It’s nice to still see one of these on a serious cruiser, and it will surely be used extensively on long passages. Four drawers are integrated into the base of the desk with more stowage hidden under the seat. Access to the engine below the companionway steps is quite good, although the genset space behind the auxiliary is tight. A five-bottle wine rack is tucked below the cabin sole—it seems the Swedes are determined not to let the French have all the fun. We got lucky on test day by being the first off the dock, and counterintuitively, we had the best wind at 0930, as things got lighter and lighter as the day wore on. 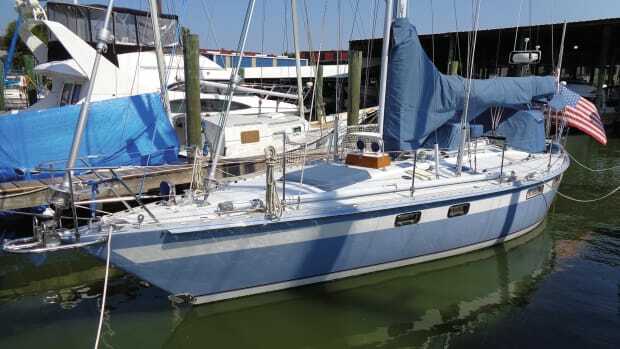 The flat waters of Chesapeake Bay and 12 knots of wind over the deck made for perfect daysailing weather, although this hardy cruiser is most certainly built for more serious conditions. At a 40 degree apparent wind angle in 11.8 knots of wind, our Elvstrom sails (including the 111 percent genoa) produced 6.8 knots. As we eased off, we still carried 4 knots at 120 degrees and 6.4 knots of apparent wind.  The giant wheel makes tacking easy, and the large single rudder bites well, making the hull very responsive. Because the current owner of our test boat plans to club race, the optional fixed cockpit table was missing, and in its place was a flip-up version, suspended from the console. Although that left the cockpit open, it meant there was nowhere to brace your feet when heeling. 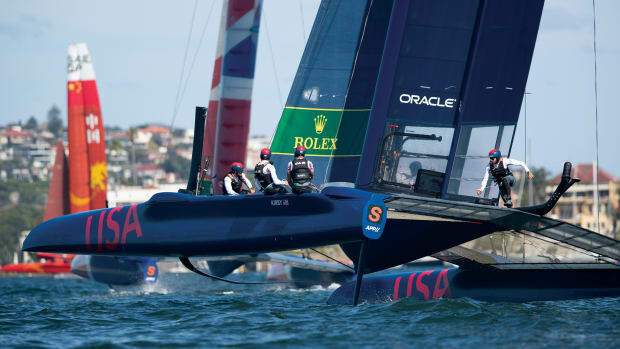 Perhaps the best combination for shorthanded sailing would be a self-tacking jib with the large Code 0 for downwind work. With a traditional mainsail configuration (an in-mast furler is an option) our morning run proved to be the best sail of the day. The HR 412 may be built for heavy weather, but she’s a boatload of fun in light conditions as well. 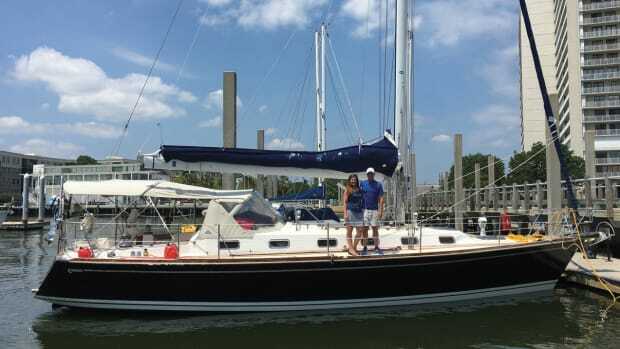 At wide-open throttle and with three of us aboard, we motored at 8.5 knots and 3,000 rpm. However, a better and more economical cruising speed is 7.5 knots at 2,100 rpm. Auxiliary power is supplied by a Volvo Penta D2 75hp diesel and saildrive, which manages the 24,400lb displacement with ease, so there’s no need for any kind of upgrade to be offered. Coming in and out of the marina, we garnered three compliments from other boats. There’s no doubt that Hallberg-Rassy gets noticed and admired. Hull #28 of the 412 was the first to arrive in the United States, and because Hallberg-Rassy builds to order, it was already spoken for and headed to the Great Lakes where it will spend the winter in a heated shed before being re-commissioned and launched in the spring. Although undoubtedly spirited, the Great Lakes don’t immediately bring to mind the need for a serious offshore cruiser. On the other hand, why not? With its easy sailplan and plenty of get-up-and-go, the 412 justly proves it’s truly a design that can be at home anywhere.